Expensify Inc., a startup focused on helping customers file expense reports, is now partnering with Uber to move people from an airport to their destination – basically bringing an Uber car right to the curb outside the airport for them. 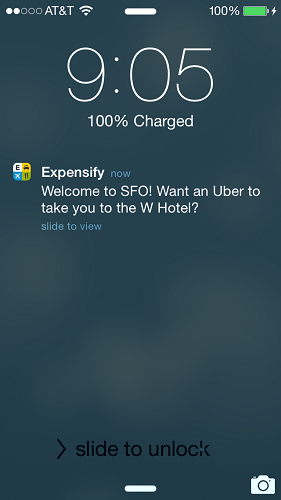 Based in San Francisco, Expensify announced it would be one of 11 partners releasing an integration with Uber’s application programming interface (API) last week. Some of these other partners included startups like Hinge and Momento, as well as major companies like Starbucks Corp. and Hyatt Hotels Corp. Branded as SmartRides, Expensify’s new feature shoots users a push notification when their plane lands at an airport, asking them if they’d like an Uber car to get them to their hotels or whatever destination they want to reach. It’s currently available to iOS and Android users. Last year, the company released Expensify Trips, which alerts users to the flight status updates and hotel reservations within their itineraries, so SmartRides just completes that part of the trip experience, says Joanie Wang, who works as part of Expensify’s marketing team. Both features are free to paid users of Expensify. While it doesn’t sound like SmartRides is related to Expensify’s usual business of providing expense reports, the idea is to position the company as part of the shift to “ambient computing,” meaning it’s always on and always available – kind of like Google Now, Wang says. She adds Expensify’s CEO, David Barrett, has talked a lot about ambient computing and its possibilities for the company. 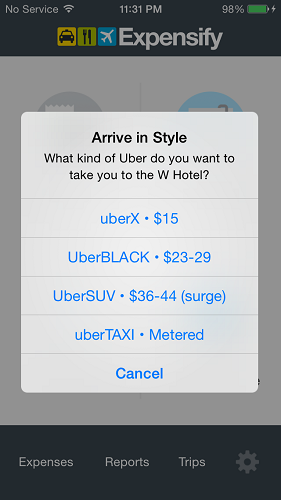 In the future, the company sees a lot of partnerships with APIs like Uber’s, improving user experiences. “I think part of it is the idea of having something always on and predicting what the user wants, before they want it. I think it’s getting harder and harder to just be a single, stand-alone app,” Wang says, adding for example, when she was searching for a place to stay in Portugal with Airbnb, she had to keep switching back and forth between its app and Google Maps, making for a pretty jarring experience. Expensify’s next foray in ambient computing is with its launch of a Realtime Expense Reports feature. Like SmartRides, it’s supposed to make it easier for users to file expense reports, with as little action taken on their part as possible. The process is supposed to be more automated, making it even easier for users to keep track of their expenses and file them right away. The feature is currently in beta and could be ready for general release by the end of this year.